The government’s Health and Social Care Bill, currently going through parliament, puts the NHS in danger by threatening the very principles it was built on. It will fragment and privatise our NHS to the detriment of patients and services. The government is still not listening to our concerns, so we need to shout even louder. The bill is still making its way through parliament and is back in the Lords from 8 February before it returns to the Commons for MPs to debate again. There is still time to influence this bill, which threatens the future of our NHS. On Wednesday 7 March, the All Together for the NHS campaign, which includes health workers, professionals, experts, patients and campaigners, has organised a rally to Save Our NHS. The aim is to drive home the message to Peers and MPs that the NHS is a treasured institution and the people that own it, work for it and use it, will not stand by while it is broken up and privatised. Privatisation will also mean cuts to terms and conditions for our members, and as services are cut, jobs will go, leading to worse services for patients. 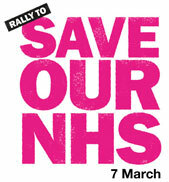 UNISON is encouraging members from across all parts of the union to attend to show their support for our NHS. The event takes place on Wednesday 7 March from 6pm to 7.30pm at Central Hall, Westminster, London. Find out more about the campaign at UNISON’s Our NHS Our Future campaign pages.